OncoSwim is a solidary open water swimming event organised by the Foundation Oncolliga Girona with the support of Radikal Swim. 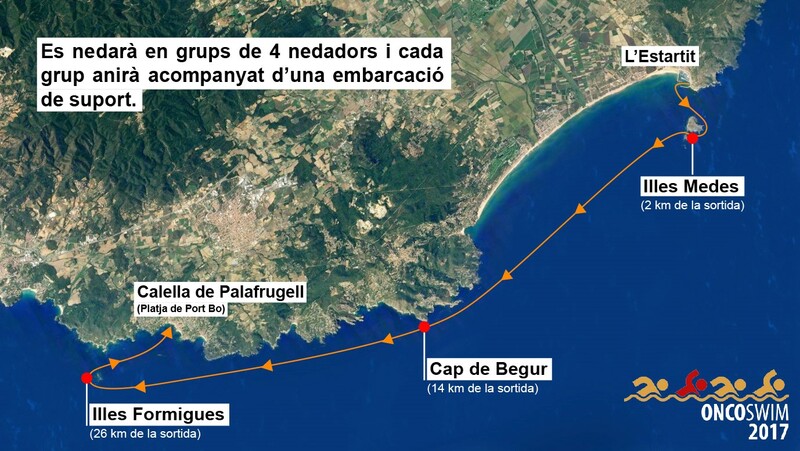 It&apos;s insignia crossing is 30km long (l&apos;Estartit - Medes Islands - Formigues Islands - Calella of Palafrugell), accompanied of the Solidary Mile, of 1.5km (Llafranc - Calella of Palafrugell). This 3rd edition will take place June 1st, 2019 with the same aim of all the past editions: collect funds to help the cancer&apos;s patients. All the teams registered at the OncoSwim crossing have the mission of gathering €500 before the day of the challenge through particular contributions or collaborations with companies, that will be managed through the platform of donations of the OncoSwim&apos;s web. Regarding the route of this challenge, it&apos;s 30km long. It starts in l&apos;Estartit and reaches Calella of Palafrugell; swimming through the Medes Islands and the Formigues Islands. Yes, you have read it well. It is a demanding journey only apt for prepared swimmers, but very epic too. The teams participating in this crossing need to be mandotory of four members that can complete the OnsoSwim route in two modalities: for teams (the four members will swim all the distance toghether), or doing relays (each swimmer does only a part of the distance, rotating during the 30km the swimmer in the water). It is an easier open water swimming crossing that consists on connecting the two traditional fishing villages of this zone of l&apos;Empordà (Costa Brava): Llafranc and Calella de Palafrugell (En Calau Beach). It&apos;s roughly 1,5km route finishes the same place as the OncoSwim&apos;s participants one. The Solidary Mile registration has a cost of 12 euros (15 euros if you have the valid Federació Catalana de Natació&apos;s licence). The start of the swim will be the same 1st of June in the afternoon (16.30PM), in order to make it coincide with the arrival of the first teams completing the OncoSwim. If you join us in this event, apart from having a great time, you will contribute to collect funds to help the Foundation Oncolliga Girona to accomplish their solidary projects and initiatives in favour of the patients of cancer and thier families. Besides, you will help us to raise awareness to the society of the importance of fighting daily and collectively against this disease. The price for the registration will be of €200 for the swimmers with federative licence in force and of €211 for those that do not have the mentioned licence. Finish: En Calau Beach - Calella of Palafrugell, between the 18 and 20PM aprox. Finish: En Calau Beach - Calella of Palafrugell. At the end of the event it will be celebrated a ceremony at the finish point of both swims with the total amont of funds that have been able to achieve. The past year we collected more than €25.000, let&apos;s go for more in this 4th edition! Official 2019 OncoSwim&apos;s gift and swimming cap. Official 2019 OncoSwim&apos;s swimmer certificate at the end of the event. OncoSwim&apos;s briefing on Friday 1st of June on 20PM at l&apos;Estartit. Support and security boat for each group swimming the OncoSwim. Sea and land security support during the crossing. Part of the basic provisioning for each group during the challenge: water and bananas. Food and liquid provisioning point at the OncoSwim&apos;s finish point. Physiotherapy service at the OncoSwim&apos;s finish point. Catalan Swimming Federation (Federació Catalana de Natació)&apos;s insurance.